Furniture upholstery & re upholstery, recovering lounge suites etc. We can help you create a cohesive look by sourcing custom furniture or re-upholstering an existing piece. If you want something special to set off the new décor but you’re not sure exactly what you’re after, we can help. Our Interior Designer can take a look at the space and come back to you with some ideas. We can arrange custom made lounge suites, dining and occasional chairs, upholstered bedheads and more. As well as looking truly beautiful, custom furniture gives you choices about arm and leg shape, seat height, width and depth. Ultimately that makes the piece more comfortable since it’s specifically built to fit you. Maybe you’re just sprucing up a tired old room or breathing new life into a treasured heirloom. We can help you pick the perfect fabric and arrange to the upholstery for you. 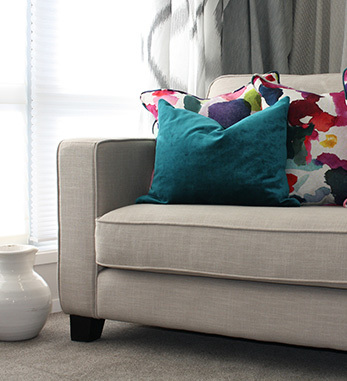 Since we stock the largest range of soft furnishings north of Auckland, we’ve literally got you covered.